Reflektive Review: "Excellent way to boost a morale at both virtual and brick and mortar companies"
Our whole organization uses Reflektive. It’s a wonderful way to publicly give credit to your coworkers and also rack your personal and professional goals. It helps especially because many of us are virtual and it’s harder to connect in that kind of environment. It’s suited well for employee recognition and manager feedback. It could be better in how it tracks ones goals and the mobile usability is kind of limited which can be annoying. Reflektive Review: "Get more visibility for the contributions you do that people don't always know about"
This is being used throughout the organization as a kudos and recognition board. People don't know what other departments do to succeed, so its really extremely helpful to notice accomplishments. We also see what individuals and departments goals are for the year. Well suited on projects that require lots of hands to give kudos. Helps me understand the projects in different parts of the Org. Gives me an idea who works really hard on things I was unaware of. Gives a chance for the org. to be more positive. Not suited: the app is hard to use and clunky. Review: "Reflektive: Making goals and responsibilities transparent company-wide"
At our company, we used Reflektive as an ongoing feedback mechanism for our staff, for goal management, and for the polling feature. We used it across the entire company with the main goal of creating greater alignment and having a process for ongoing measurement rather than infrequent annual measurements. We replaced a micro-survey tool with the product and a form-based performance review process. Reflektive was continually making updates to their product. Reflektive's had good plug-ins that met users where they were at (Gmail, etc). It was very easy to nudge or follow up with employees who had not completed their reviews. Reflektive often didn't do the best job informing users about the product changes we could expect to see. Oftentimes, it was hard to know exactly who would see what in the system. We had to go to our customer service rep for a lot of questions that we wished were more thoroughly explained in the help center. Reflektive is a good tool to use if you are looking to move away from a very administratively heavy performance review process, and you want some customization options. If you are a technology company and love nimble software with easy deployment, this will likely fit into your organization quickly with easy implementation. Still, there were some tricky things about it and the product is "in process," which can sometimes be frustrating as an administrator. Reflektive Review: "The Easy To Use Employee Gratitude Solution"
We use Reflektive as a tool to publicly thank and show gratitude to coworkers across the organization, in every department. The tool enables employees to call out specific people, leave an encouraging note on a public feed, and hashtag applicable emotions, feelings, or sentiments that might be applicable to the action taken. Simple & Easy to Use: Reflektive uses a streamlined UI that is solely focused on giving and showing employee gratitude. Alerts: The tool emails you to let you know when someone has thanked you. Integration: You can use the Reflektive web portal or use the Gmail integration which enables users to leave feedback without navigating to a separate site. On the sidebar, it would help to have a custom list linked to employees which enable users to quickly give gratitude to employees that work with the most closely. Allow profile pictures to be pulled directly from Google or Facebook. Reflektive is well suited for medium to large organizations where cross-functional work is a regular occurrence. It isn't meant to be used for employee reviews, self-reviews, or take the place of a corporate communications platform; rather, it is meant to do one thing - serve as a public soapbox and repository for giving and receiving employee gratitude. Review: "Up Level Performance Management + Rewards and Recognition with Reflektive!" Adaptive and evolving product with a development team willing to listen! Reminders to complete a task would be really helpful! If you want to partner with an adaptive development team that will listen to your feedback and evolve their product to meet your company's needs! Reflektive Review: "Great for recognition"
We use Reflektive across our whole company. It’s been a great way to provide feedback and praise. For larger organizations, it’s an easy way to share success stories or thank other employees. In larger organizations, it is difficult to communicate and share news with everyone without sending all-agency emails. Reflektive lets you provide that feedback or recognition for everyone to see, but saves your inbox from unnecessary emails. The weekly roundup email highlights a few of the most recent recognitions. It’s nice to see a brief highlight, without having to get notifications for each post. Reflektive let’s you tag multiple people in a post, so you can thank a whole team in one post. We have had issues with the chrome extension and plug-in. But the issues are resolved. Reflektive is great for large organizations that need a simple method of communicating feedback and giving recognition. It definitely helps boost moral amongst teams. This is not a platform that is meant for file sharing or project management types of communication. User Review: "I Reflect on Reflektive"
We use Reflektive across the organization for OKR setting and reviews, annual performance reviews, peer to peer recognition and manager in-the-moment feedback to employees. It is addressing the need for feedback and enabling employees to know where they stand at all times. The peer to peer recognition through celebrations and how that integrates in to Slack is great. Enabling a performance "file" on every employees, so at review time it is seamless to look back at the feedback someone has received throughout the last review period. The UI and ease of use for all users and admins. Well suited for small growing companies that want a flexible performance management solution. I think it would only not be appropriate in environments that want to keep long form reviews and only need it one time a year. Reflektive Review: "Great service offering, but decide whether it's a priority for your business"
[It's] Used by our entire organization for goal-setting, progress check-ins, one-on-one conversations with managers, and promotion cycles. It's a pretty simple product; for a small company, the value could probably just as easily be achieved via Google Sheets. [It's] Good for a growing or already mature company. Keep the process simple to get buy-in from all users (don't make it too burdensome or you will lose value). It's good for companies to track progress against individual goals, have a data repository for progress, and make sure employees feel accountable. Probably not great for a smaller/still scaling company where this is not yet an area of focus. Review: "Reflektive a basic tool not good for full employee engagement"
We are trying to use Reflektive for employment engagement, peer recognition, surveys and performance management. Reflektive is good for small tech companies that just need a simple recognition tool. It is not good for a full employee engagement tool as it is very limited in its customization and reporting features. User Review: "Reflections on Reflektive"
Reflektive is used by the entire company, across 4 locations in 2 countries. Reflektive is used by 300 employees across all departments. It is used as a tool for ongoing feedback (the recognition wall) and also for periodical performance reviews. The ongoing feedback tool is very easy to use, with the gmail plugin you can thank people "on the go". The mobile app is dreadful :( it's just a link to their web-view and it's not really responsive. Reflektive will be a good tool for performance reviews. It's very flexible and customizable so easy to admin, and also very straight forward for the employees. Reflektive is a talent development platform that is comprised of a holistic and integrated suite of performance products and solutions. The vendor says Reflektive is the leading talent development choice for over 180 of the world's top places to work, including Pinterest, Twilio, SquareTrade, Thumbtack, Glassdoor, Quantcast, UltraGenyx, AltSchool and Flatiron Health. The Reflektive Talent Development Platform starts with Real-Time Feedback, an integrated user experience for data-driven employee coaching on a daily and weekly basis. 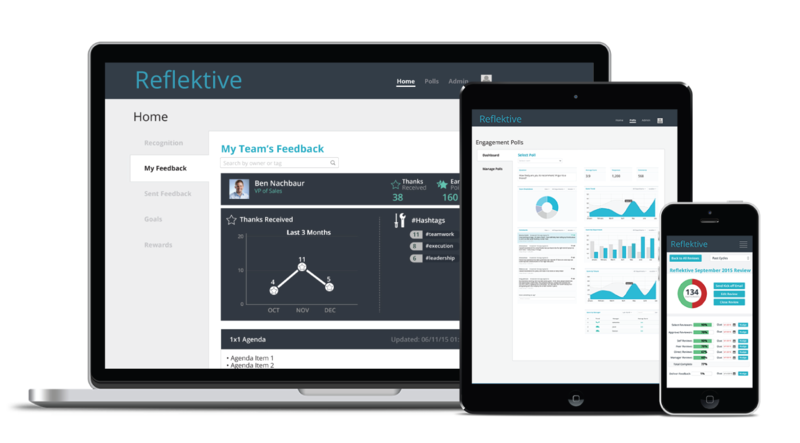 Built for engagement and flexibility, the Reflektive Platform offers numerous interchangeable modules including goal management, performance check-ins and lightweight performance reviews to create the right performance and talent development processes for every business across virtually every industry. Reflektive was founded in 2013 and is funded by Lightspeed Venture Partners and Andreessen Horowitz. The company is based in San Francisco, California.